In school two separate computer labs are available for primary students (1st to 5th Class) & Secondary Students (6th to 10th Class) to perform practical's. Technology plays a major role in twenty-first century education. The new model of integrating technology into the curriculum means that computers are on demand throughout the school day. Technology teachers and administrators face the task of developing a technology plan that makes the most effective and efficient use of the computer hardware available to them. Whether using desktops or laptops, Macs or PCs, the computer lab remains the center for most computing activity in schools. In our school two computer labs are available one for Primary students and one for secondary students. In primary Computer lab total 30 computers are available for students. As per strength of our class is restricted to 30. Computers in computer labs are typically equipped with internet access. In primary Computer lab there is a server machine. A server is a computer program or a device that provides functionality for other programs or devices, called "clients". This architecture is called the client–server model. A single server can serve multiple clients, and a single client can use multiple servers. CCTV is available in lab for safety & security purpose the lab is monitored under CCTV camera. Monitoring in lab containing materials or hosting activities that are highly sensitive or dangerous and thereby raise compelling health, safety, and/or national security concerns Computer lab is available for instructional, drop-in and practical purpose for students as well as teachers also. While computer labs are generally multipurpose, labs may contain computers with hardware or software optimized for certain tasks or processes, depending on the needs of the institution operating the lab. It has advanced infrastructure in terms of hardware and software which cater to the requirements of the students, teachers and the curriculum. The school is equipped with a dedicated broadband Internet connection for enterprising students to get a chance to be familiar with the Internet. They do comprehensive research for their projects and presentations. The faculty members make continuous efforts to see that the students must get expertise in practical implementation of tools they have in their curriculum. The Information Technology curriculum has been planned in such a way that the students of classes I to V will get exposure to various technologies and software's. In the primary section, the students are trained to use basic software's like Windows, Ms-Paint, MS-Office (Ms-Word, MS-Power point, Ms-Excel etc.). Along with this, they get exposure to computer programming at elementary stage through the computer languages like LOGO and Algorithm, flowchart in order to improve their logical skills. The students are assessed on their practical skills over a regular time interval via projects and assignments given to them. Besides taking care of the curriculum, the students are given opportunities to participate in various competitions allied with Information Technology like NCO (National Cyber Olympiad) at National level and they come to know where they stand. The faculty members work hard with the students to bring them up to the level of expectation to compete with the students all over the country. The computer lab serves as the center for teaching computer use to whole classes, usually by a skilled computer teacher. Classroom teachers also use the lab with their classes for research, or for creating technology-based projects. Technology experts use the computer lab for teacher in-services where they instruct teachers on various aspects of using computers in educational settings. A computer lab comes in several configurations: the most common are the "U" shape and the square models. The "U" or square configurations allow the teacher to monitor student activity. Several large tables in the center of the room provide space for offline work. Projectors, smart boards, software and a variety of peripherals like digital cameras and camcorders are usually stored in computer labs. The number of computers in a lab varies from a few computers in the case of a mini-lab to as many as thirty plus computers in a lab. Computer skills allow a child to become exposed to new ways of thinking, using both their creative and logical thought processes. Math, science, art, and other subjects can be incorporated into lesson plans in fun and interesting ways for children of all ages and learning capabilities. A good education equips children with the skills necessary to find jobs and help advance their country's economy. Whether using desktops or laptops, Macs or PCs, the computer lab remains the center for most computing activity in schools. In our school two computer labs are available one for Primary students and one for secondary students. In senior computer lab high configured (i5 3rd Generation, 4GB RAM, 250 GB HDD) 38 computer are available on which students perform their practical's. On each computer of senior computer lab following application software's are installed. Computer lab is available for instructional, drop-in and practical purpose for students as well as teachers also. While computer labs are generally multipurpose, labs may contain computers with hardware or software optimized for certain tasks or processes, depending on the needs of the institution operating the lab. It has advanced infrastructure in terms of hardware and software which cater to the requirements of the students, teachers and the curriculum. 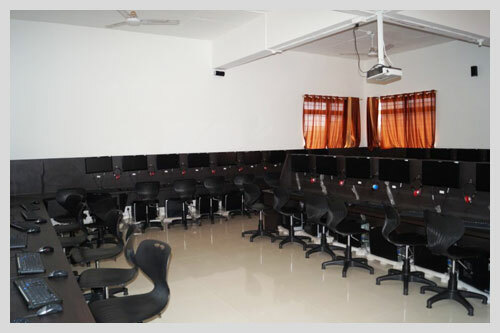 The school is equipped with a dedicated broadband Internet connection for enterprising students to get a chance to be familiar with the Internet. Function: The computer lab serves as the center for teaching computer use to whole classes, usually by a skilled computer teacher. Classroom teachers also use the lab with their classes for research, or for creating technology-based projects. Technology experts use the computer lab for teacher in-services where they instruct teachers on various aspects of using computers in educational settings. Features: A computer lab comes in several configurations: the most common are the "U" shape and the square models. The "U" or square configurations allow the teacher to monitor student activity. Several large tables in the center of the room provide space for offline work. Projectors, smart boards, software and a variety of peripherals like digital cameras and camcorders are usually stored in computer labs. Size: The number of computers in a lab varies from a few computers in the case of a mini-lab to as many as thirty plus computers in a lab.